with Italy as our final destination. Three months earlier, on September 9, the Allied Fifth Army had landed at Salerno and encountered heavy resistance. As the troops moved slowly inland the Germans retreated to a position north of Naples, building fortifications across the boot of Italy that became known as the Gustav Line. The Allies had hoped to be in Rome by Christmas, but the snow-choked roads and rough terrain favored the enemy. Weeks of rain and snow created a quagmire and greatly handicapped the movement of men and heavily mechanized equipment. 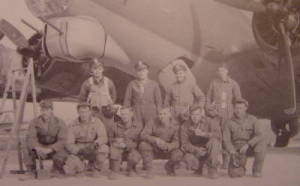 My B17 crew and I landed at Casablanca on December 18. We were delayed in North Africa 32 days, waiting for repairs on our plane. 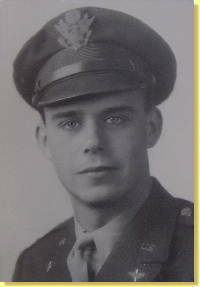 When we finally joined the 414th squadron in southern Italy on January 22, the Fifth Army was still mired in mud, struggling to dislodge the Germans from the Gustav Line. January 22 marked the infamous landing of two divisions of VI Corps at Anzio, sixty miles north of German fortifications. They encountered little initial resistance, but while waiting for reinforcements our troops were counter-attacked and surrounded by the Germans. Even with air and sea support VI Corps remained trapped on the beachhead for four months. The Fifteenth Air Force, based on airfields near Foggia, was established to bomb targets in Germany and its satellites. With the Fifth Army stagnated in southern Italy, the ground troops needed all the air support they could get. 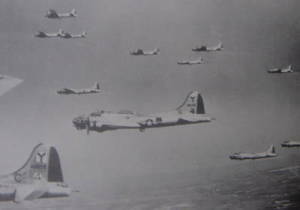 The main mission for the medium bombers and fighters in the Twelfth Air Force was to support ground troops, but the B17s and B24s in the Fifteenth were often called upon to assist. Our plane was one of about 300 heavies that bombed German troop concentrations near Anzio on two occasions. When the target was marshalling yards, railroad communications were severed, forcing the enemy to move ammunition and supplies by trucks more than a hundred miles at night to their troops defending the Gustav Line. The decision to bomb Monte Cassino was devised to support the ground troops. This historic monastery was reduced to a pile of rubble by our B17 heavy bombers on February 15th and the Germans, who had not formerly used the shrine for defense, moved in and set up their artillery. The enemy position was more impregnable than before. All winter and spring the Fifth Army was stalemated north of Naples and VI Corps was trapped on the beach at Anzio. While the infantry and support troops were trying to crack German defenses on the ground, we were fighting our battles in the sky. My B17 Flying Fortress crew flew twenty-two missions, bombing targets in Italy, France, Bulgaria and Germany. During the "Big Week" in February 1944, the Eighth and Fifteenth Air Forces coordinated missions, hitting the German aircraft industry for six consecutive days, from February 20th to the 25th. 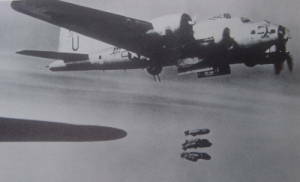 My B17 Flying Fortress crew bombed the Messerschmitt aircraft component plant at Regensburg-Prufening on February 22nd and the Messerschmitt factory at Steyr Daimler on the 24th. We encountered layers of flak, swarms of fighters, and long range rockets fired from twin-engine German aircraft. Of the 87 bombers sent to Steyr on February 24th, seventeen were shot down by the Germans. Total Fifteenth Air Force bomber losses for the "Big Week" were 89 aircraft, or 18%. Eight hundred and ninety army airmen were killed or missing. We began to wonder when our number would come up. Ground troops can retreat when fighting a losing battle, but when a plane is fatally damaged, the only retreat is a parachute. On March 18, 1944 we had to use that parachute. For forty-five days we walked in the mountains of Yugoslavia hiding from the Germans. This is the story I tell in Bail Out over the Balkans. Purchase today and the authors will personally autograph your book.